The Ryzen family of CPUs is designed to compete, initially, in the performance-mainstream and high-end desktop market. At first will be the launch of Ryzen 7 CPUs, a trio of eight-core, sixteen-thread designs, with Ryzen 5 and Ryzen 3 coming in Q2 and 2H17 respectively. Out of the CPUs we know about, the Ryzen 7 parts, the processors have a TDP of either 65W or 95W, and prices will range from $330 to $500. All the processors will be using the AM4 socket, with bases frequencies from 3.2 GHz to 3.6 GHz, and turbo frequencies up to 4.0 GHz for the high-end parts. The base design supports 512KB of private L2 cache per core and 2MB of a shared exclusive L3 victim cache. The high-end parts are ‘Ryzen 7’, which all happen to be eight-core parts and start around $300-$320. With a fully enabled chip, 16MB of L3 cache is available. In the mid-range are ‘Ryzen 5’ processors, set to be launched in Q2, which are all eight-core parts under the hood but are either 6-core parts or 4-core parts depending on the model. Leaks would tend to suggest that despite having two cores disabled, the 6-core parts still have access to all the L3 cache. At the bottom are ‘Ryzen 3’, due 2H17, all of which are quad core parts but do not have hyperthreading. It’s worth noting that ‘Ryzen 7 1900X’ is a gap waiting to be filled. The formal name for these CPUs is ‘Ryzen 7’ followed by the SKU number. Having conversations with AMD, and noting that I suspect these names will colloquially be shortened to R7, R5 and R3 very quickly, we will be following convention and using the formal CPU names. All these parts come from a single silicon design, with binning to ensure that the quality of each silicon die gets placed in the right bin. It is worth noting AMD’s tactics to launch a handful of SKUs at once follows on from its previous strategy. Part of it is a function of size (AMD by contrast to other players is actually small), and it allows AMD to react to how the market changes, as well as adjust product lines due to factors in the production (such as better semi-con characteristics). All the CPUs are multiplier unlocked, allowing users to go overclocking when paired with the X370 or B350 chipset. At this point we’re unsure what the upper limit is for the multiplier. We have been told that all CPUs will also support XFR, whereby the CPU automatically adjusts the frequency rather than the OS based on P-states, but the CPUs with ‘X’ in the name allow the CPU to essentially overclock over the turbo frequency. XFR stands for ‘eXtended Frequency Range’, and indicates that the CPU will automatically overclock itself if it has sufficient thermal and power headroom. We’ll mention it later, but XFR works in jumps of 25 MHz by adjusting the multiplier, which also means that the multiplier is adjustable in 0.25x jumps (as they have 100 MHz base frequency). XFR does have an upper limit, which is processor dependent. All CPUs will support 25 MHz jumps though XFR above the P0 state, but only X CPUs will go beyond the turbo frequency. A side note: As to be expected, XFR only works correctly if the correct setting in the BIOS is enabled. At this point the option seems to be hidden, but if exposed it means it is up to the motherboard manufacturers to enable it by default – so despite it being an AMD feature, it could end up at the whim of the motherboard manufacturers. I suspect we will see some boards with XFR enabled automatically, and some without. We had the same issue on X99 with Turbo Boost 3, and Multi-Core Turbo. So Why No Ryzen 5 or Ryzen 3? AMD is remaining relatively quiet on the other Ryzen CPUs. At the Tech Day, we were told about one other CPU: the Ryzen 5 1600X. This six-core part will have two CPU cores disabled, though it is unclear if AMD will disable one core per cluster of four (giving a 3+3 arrangement) or if they could disable two from one cluster (giving 2+4). Nonetheless, it maintains the 3.6 GHz base frequency and 4.0 GHz turbo frequency similar to the Ryzen 7 1800X. This puts it square in the firing line of the Core i7-6850K (six core, Broadwell-E) and Core i7-5930K (six core, Haswell-E). Ryzen 5 is scheduled for ‘Q2’, meaning the second quarter of 2017, or April-to-June inclusive. The big event in that time frame in the PC world is Computex at the beginning of June, which might be an apt time to launch some other products as well. The scale of the Ryzen 5 launch is unknown, and I suspect that if the demand for Ryzen 7 is high then AMD might not have enough CPUs to go around. If enough parts come out of the Fab working well, and Ryzen 7 is still selling strong, then we might have to wait for Ryzen 5. This aids part of AMD’s trickle-out strategy, though based on some of the comments we’re seeing online, Ryzen 5 is also highly anticipated. The Ryzen 3 family is even more unknown. At this point the leaks suggest that these will be quad core parts without simultaneous multi-threading, however AMD has not released any information as to how they will work. The only thing we know is that AMD is planning a H2'17 launch, meaning the second half of 2017. That’s a very, very wide window, encompassing things like the Server chips launch but also the notebook SoCs. I suspect AMD will be constantly looking at their product lines and sales, determining what opportunities there are for Ryzen 3 CPUs – if they get a full launch or end up a footnote if the rest of the stack performs above expectations. Or Ryzen 3 could end up mobile only, but that’s just a low-chance hypothesis. I saw Ryzen Pro being in the leaks? At this time AMD is not announcing any Pro parts, although it was confirmed to be that there are plans to continue the Pro line of CPUs with Ryzen to be launched at a later time. These parts will be similar in practice to previous ‘Pro’ models we saw with Kaveri and Carrizo: designed for the big OEMs as an indication of large-contract support. AMD’s prominent partners for this are HP, Lenovo and Dell. These processors will most likely not be sold to the public, although OEM resellers typically get hold of a few. That means availability at this point is unknown. AMD states that multiplier overclocking is supported on all processors, however at the time of writing we’re unsure if that would naturally include the ‘Pro’ line. My gut instinct says ‘probably’, although the systems these CPUs will go into will likely have overclocking disabled, so it would have to be placed into a consumer motherboard. A side note on ECC: given the design of Naples and the fact that it should be supporting ECC, this means that the base memory controller in the silicon should be able to support ECC. We know that it is disabled for the consumer parts, but nothing has been said regarding the Pro parts. We can confirm that ECC is enabled on the consumer Ryzen parts. At the top end we see the eight-core R7 1800X put directly against a Broadwell-E based eight-core Core i7-6900K. The Ryzen 7 1800X sits at 3.6 GHz base and 4.0 GHz turbo for 95W, while the Core i7-6900X is 3.2G/3.7G for 140W. The i7-6900K has the bigger L3 cache and more PCIe lanes, but costs twice as much ($1049 vs. $499). In the mid-range, the Ryzen 7 1700 is so near in price to the Core i7-7700K that it is hard to miss. The i7-7700K is based on Intel’s latest Kaby Lake microarchitecture, which AMD has already shown is ahead of the game compared to Zen. So while Intel gets a frequency advantage (4.2G/4.5G vs 3.0G/3.7G) and is likely to have a fundamental IPC advantage, the AMD Ryzen 7 1700 comes with eight cores over four, and has 16MB of L3 cache compared to 8MB on Intel. The 1700 and 7700K are similar in price ($330 vs $350) but the 1700 also comes with a new variant of AMD’s high performing Wraith cooler. Because we know some specs already, it’s worth pointing out about the Ryzen 5 1600X. Expected pricing should put it close to the price of the Core i5-7600K, but offering three times as many threads. The Ryzen 5 will be down on frequency, but cache and cores is hard to miss. When we get in the Ryzen 5 samples it is sure to be a major test. The validity of these comparisons will come down to how well AMD has executed in single core performance, and if having the L3 as an exclusive victim cache actually hampers performance, especially in memory heavy workloads such as compression. Typically we would expect fewer cores at the same power to be clocked higher as there is TDP to spare. However, these four core designs can differ between two successive chips. The base design of all of these CPUs is a set of eight cores, split into two quad-core ‘Core Complexes’ (known as a CCX). 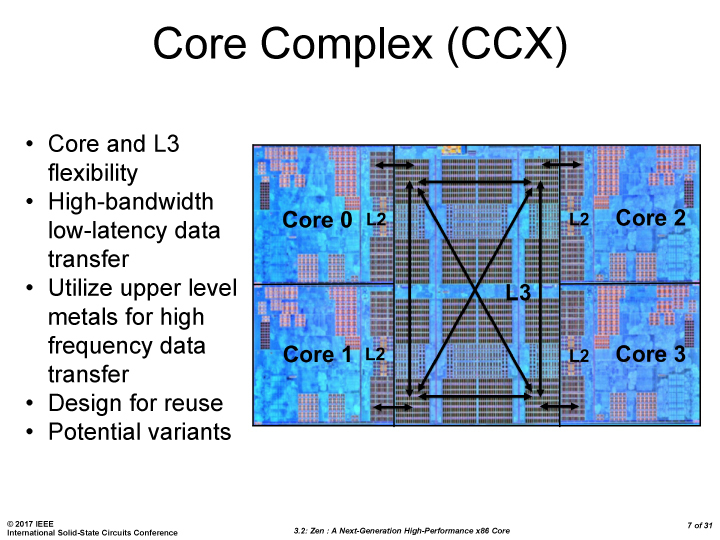 Each CCX has four cores and 8MB of L3 cache, but are still part of the same silicon die and connected by the new Infinity Fabric. For a quad core design, four of those cores (and their L3 caches) are disabled, however it is never guaranteed which ones. Users could end up with 4+0, 1+3 or 2+2 cores active per CCX, which gives a slightly skewed latency response when having to pull memory from other caches. Because the L3 cache is an exclusive victim cache, this won’t happen as often as perhaps an inclusive cache might, but as a result it is expected that the reduce frequency might be to compensate for the different CCX configurations that might exist. Intel already slashed prices pretty drastically 4 days ago, to kinda deflate Ryzen's release. Before price cuts, Ryzen had a huge price and performance advantage at all metrics, and Intel would have looked ridiculous. I can't believe people aren't reporting the price-cutting right before Ryzen release more. Intel only did it to save face on graphs and confuse people. Ryzen definitely had Intel by the balls a week ago before the price cuts. After seeing a gaming-focused review, I'd say the AMD procs are just OK. I welcome AMD is back with a fighting chance, but about half my purchase choice will be game-inspired. "For gaming, it’s a hard pass. We absolutely do not recommend the 1800X for gaming-focused users or builds, given i5-level performance at two times the price." For gaming builds the upcoming Ryzen 5 and 3 series will offer a lot more bang for your buck and will compete much more aggressively. However, the Ryzen 7 still offers decent gaming performance and excellent performance everywhere else. The gobs of cores may come in handy in the future too, even in games - as more threads will be available on more rigs, devs will take notice. This year AMD is definitely lowering the pricing for 8-16 thread processors, clearing a path for the future of gaming.